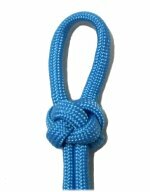 Description: The Knife Knot is also called a Diamond Knot, or a Knife Lanyard. 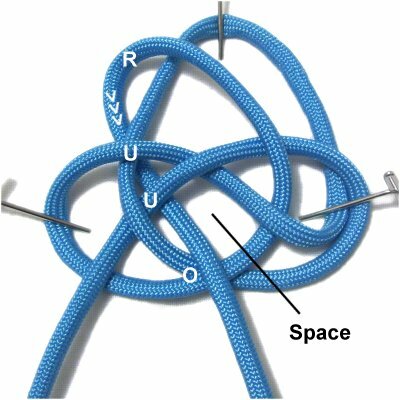 Sailors used to create these knots with thick rope. 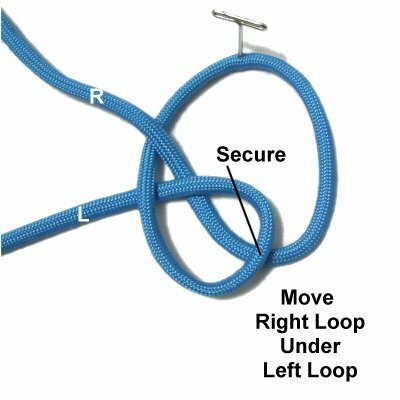 They would pass a knife through the knot and secure the loop to a belt. 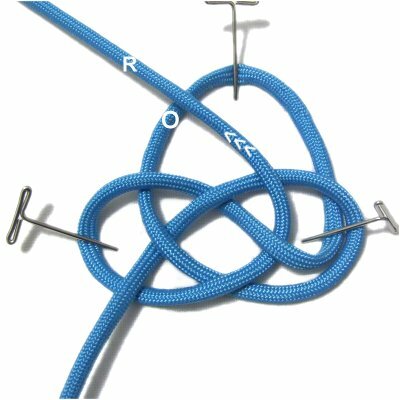 You can tighten the knot completely, or make the knot with two cords, if you don't want a loop at the top. These options are described below. 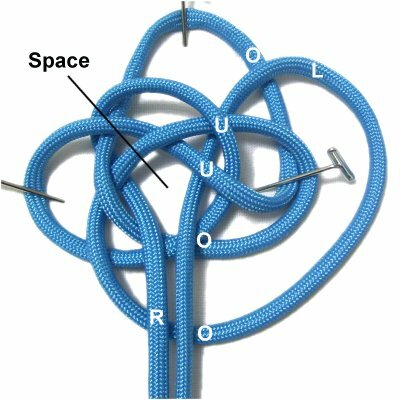 Step 1: Fold a 36-inch cord in half, securing it to your board at the center. 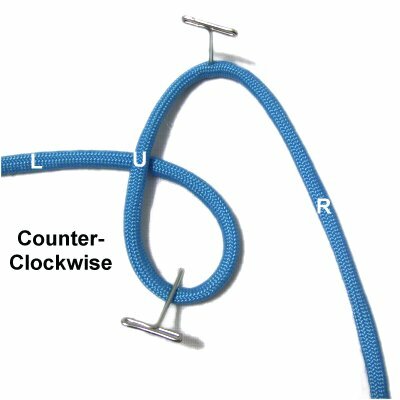 Make a counter-clockwise loop with the left half, passing under the vertical segment to form the crossing point. 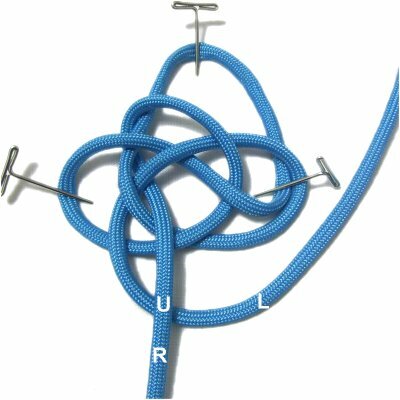 Step 2: Make a long loop with the right half of the cord, moving clockwise. 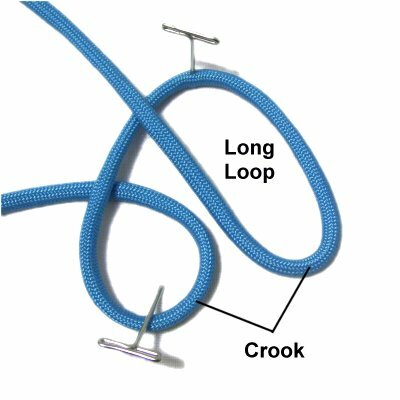 The crook of both loops should line up. Step 3: Move the right loop under the left loop. Secure both loops where they cross (at the crook). Step 4: Move the right half of the cord under the left half, rotating counter-clockwise. 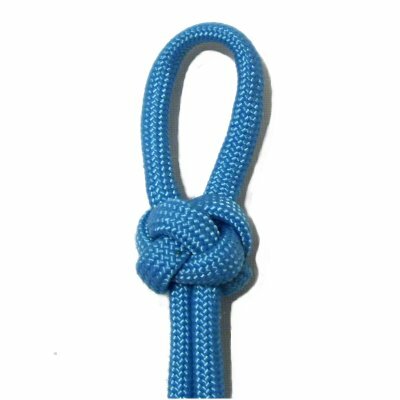 Pass it through the first loop over - under - over, as you bring it to the right side of the Knife knot. It goes over the segment furthest to the right. Step 5: Tighten the knot slightly, and balance it so the loops are the same size. Secure all three loops. 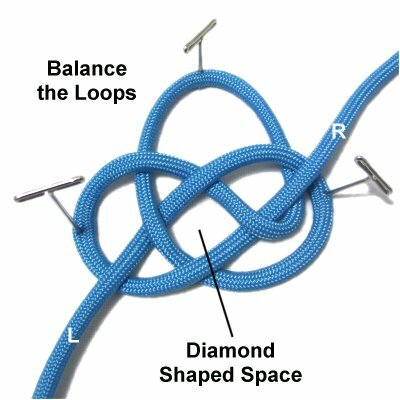 Identify the diamond shaped space in the center of the knot. Step 6: Move the right half of the cord to the left, passing over the segment that leads to the top of the knot. Step 7: Bring the right half of the cord through the diamond shaped space from below. 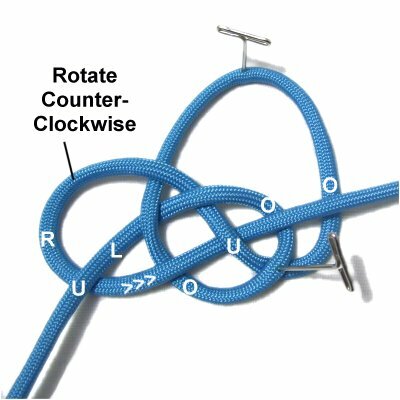 To do this, you pass under a few segments and over the crossed area at the bottom of the knot. Step 8: Move the left half of the cord to the right, passing it under the right half in the area outside the knot. Step 9: Bring the left half over the segment leading to the top of the knot (on the right). Pass it through the diamond shaped space from below, following the same path as the right half. Step 10: Tighten the Knife Knot by first making adjustments to the size of the loop at the top. I recommend you keep it secured while tightening the rest of the knot. Follow the cord all the way through the knot, removing the slack gradually until it's firm. 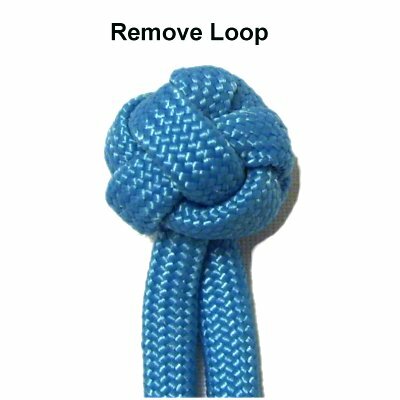 You can remove the loop at the top simply by tightening the knot completely. You can make a nice clasp by creating a a small loop at one end of the bracelet or necklace. 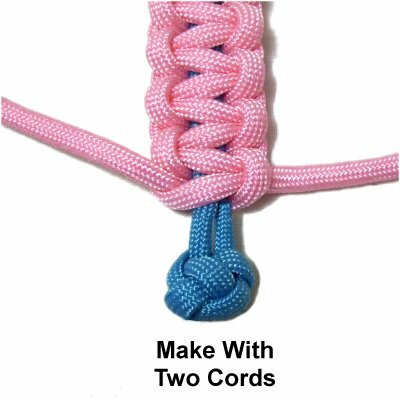 At the opposite end, make the Knife Knot with two cords. When it's tightened, cut off the extra material. Have any comments about the Knife Knot? Contact Me.